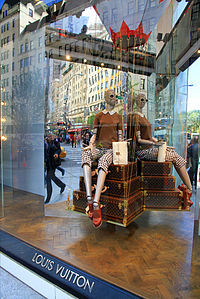 Louis Vuitton Malletier, commonly referred to as Loui Vuitton or shortened to LV, is a France fashion house and luxury retail company founded in 1854 by Louis Vuitton. 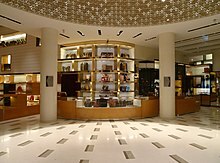 The label's LV monogram appears on most of its products,ranging from luxury trunks and leather goods to ready-to-wear, shoes, watches, jewelry, accessories, sunglasses and books.Louis Vuitton is one of the world's leading international fashion houses; it sells its products through standalone boutiques, lease departments in high-end department stores, and through the e-commerce section of its website. 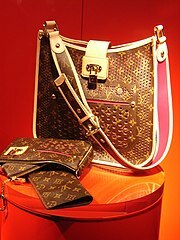 For six consecutive years (2006–2012), Loui Vuitton was named the world's most valuable luxury brand. Its 2012 valuation was US$25.9 billion. The 2013 valuation of the brand was US$28.4 billion with revenue of US$9.4 billion. 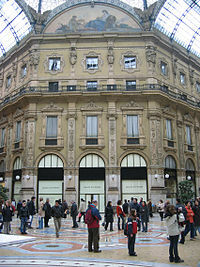 The company operates in 50 countries with more than 460 stores worldwide.